The British Film Institute Festival launch is always a great event, packed with A-list names alongside thousands of visitors which attend over its 11 day duration. Taking place one a year, the festival launch showcases a variety of new films – the 2018 edition took place in the Victoria Embankment Gardens in October. We had the pleasure of supporting the event with our black tiled mobile bar hire. The festival kicked off on the Embankment in London on October 10th, with different events going on across the capital up until October 21st – with a semi-permanent site at Victoria Embankment Gardens, where our sleek black tiled mobile bar was situated. 2018 was hailed as one of the strongest line ups in the festival’s 62 year history with big gala screenings of films such as Steve McQueen’s ‘Widows ‘ and Yorgos Lanthimos’s ‘The Favourite’. Amongst various screenings there are also Q&As, masterclass with filmmakers, as well as talks and workshops. The location on the Embankment acted as a base for some of these activities, with the black tiled mobile bar hire getting put to good use, serving a variety of cocktails, soft drinks, hot drinks and more. For this particular event we were asked to provide our dry bar hire service, which quite simply involves the hiring of one or more of our mobile bars – although all of which come fitted with sinks and taps, insulated ice rails and speed rails as standard. For many of our events we will provide more; perhaps a couple of our highly-skilled flair bartenders to operate the bar, our crystal-cut glassware or a grand cocktail menu with all the stock included – although we are also happy to come by put together your mobile bar for you and leave it with you for however long you need it. 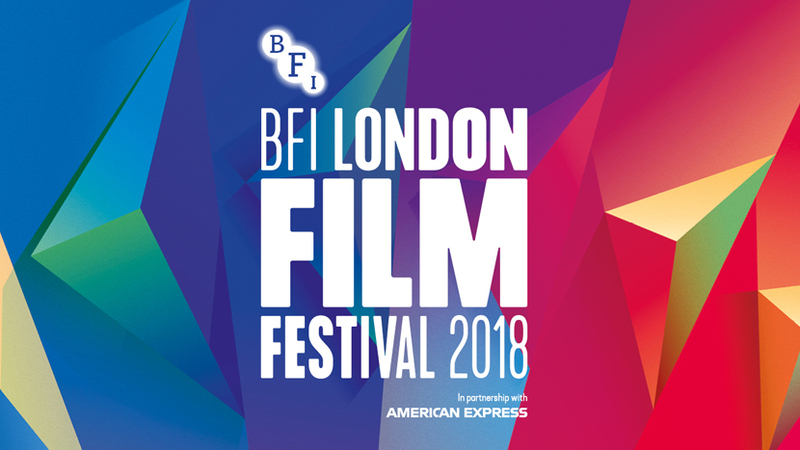 The British Film Festival took advantage of our long term dry bar hire, renting our 7 meter black tiled mobile bar for the duration of 3 working weeks. 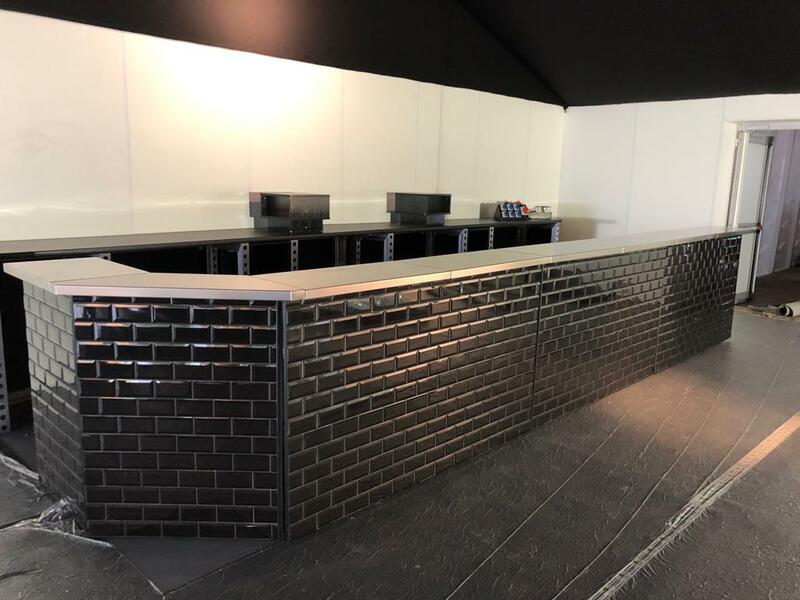 When long term mobile bar hire is required, due to our large amount of stock and varying fascia, we are able to offer you a preferred rate which ensures that you get value for money for your long term mobile bar rental. 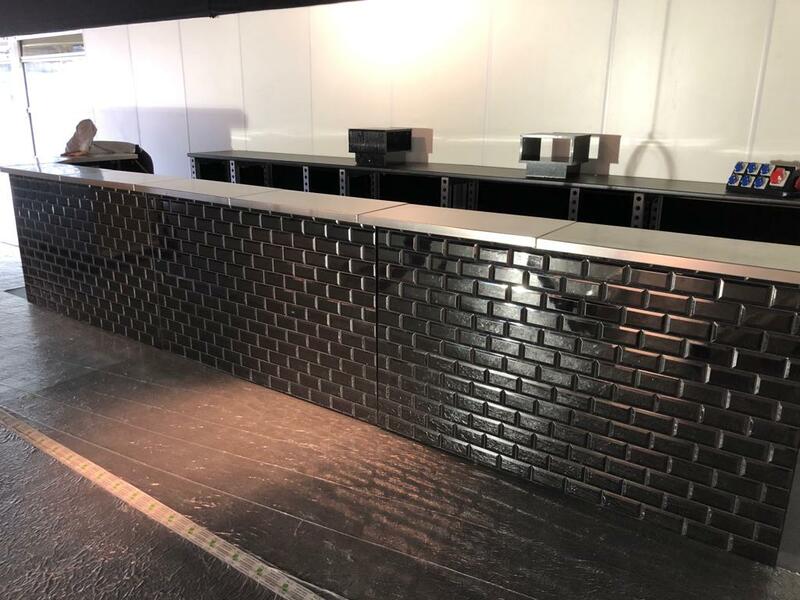 If you are interested in our black tiled mobile bar hire, a different tiled mobile bar, bartender hire – or anything else then please do not hesitate to get in contact.